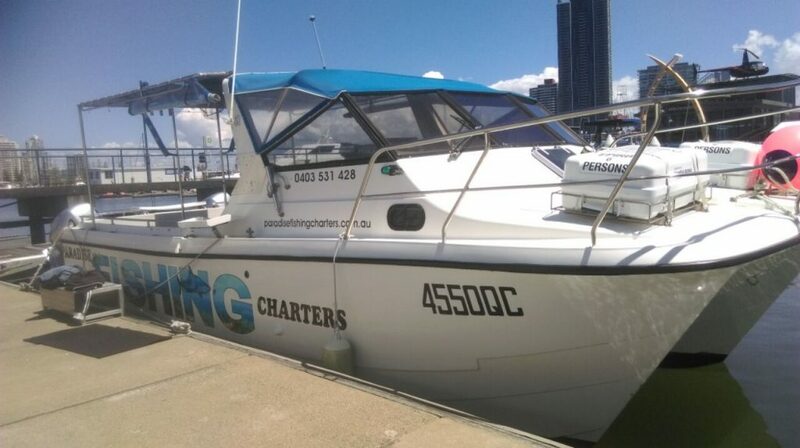 We go out further than other Gold Coast fishing charters. Contact us today for more information or make a booking. 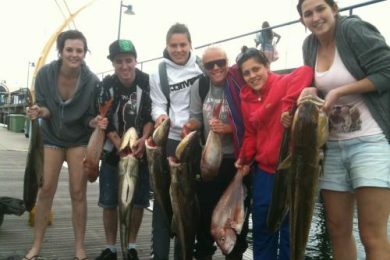 FANTASTIC FISHING ON THE GOLD COAST ! The abundance of fish, the vast array of species, the wildlife and the location all add up to the fishing adventure of a lifetime and a must do when you visit the Gold Coast! 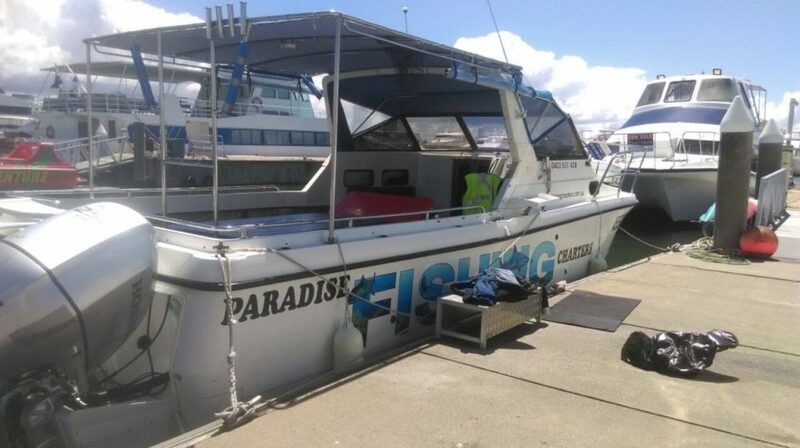 Paradise fishing charters’ friendly skipper and deckhand will offer all the help you need to ensure your day with us is memorable, whether you’re a beginner or a seasoned angler alike. All our fishing trips include bottled water, and full day charters also include a fantastic lunch package. The boat is a legendary Kevlacat 3100, powered by twin 250 horse power Honda 4 stroke engines, so we get you to the fish- fast! The boat has a full length shade awning and there is a toilet on board. All fish are gutted & gilled, cleaned, iced down and bagged for you. You keep what you catch! We’re very confident that you’ll catch a fish during your trip. 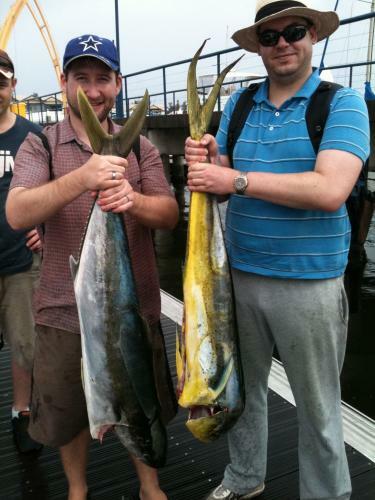 We offer fishing trips to suit all from first timers to seasoned anglers. We are happy to take single person or group bookings up to 10 persons. 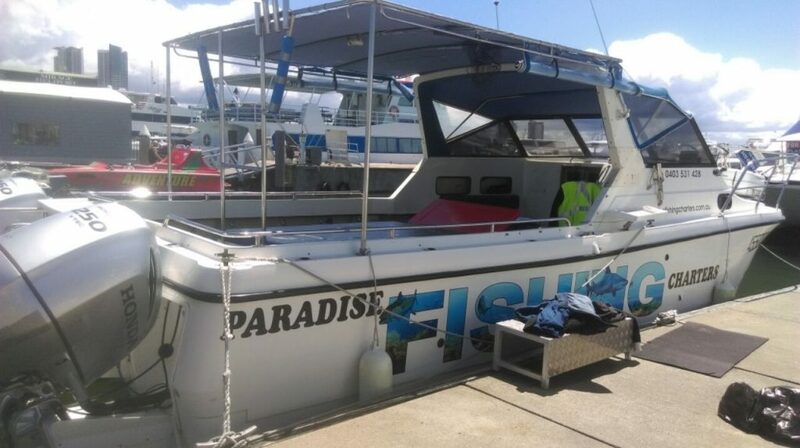 Calm water 4 hour, 5 hour deep sea/reef, 9 hour deep sea/reef, game fishing, specialised deep sea jigging, or soft plastic charters, or even purely sight seeing or island resort visits. Just call for information. All charter options include bottled water. Our 9 hour charter also includes a great lunch. This option is suited to all. Here, we travel to reefs up to 25 kilometres from the Seaway which are up to 65 metres deep. These areas are great to catch Snapper, Cobia, Mackeral, Marlin, Tuna, Wahoo, Mahi Mahi and shark. We use a combination of bottom baits, float baits, live baits and soft plastics. Ok, this one is more for the experienced fisher, or for those who want big fish! We travel to the distant reefs up to 50km off shore and 100 meters deep. Here you can catch Snapper, Amberjack, Samson fish, Kingfish, Pearl Perch, Job fish, etc. We use cut fish and squid baits, live baits, and deep sea jigs here. Better eat your Weet-Bix for this one! Our calm water fishing is great for families or those who are prone to motion sickness. 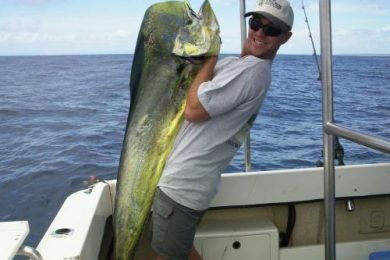 We fish the sheltered Gold Coast Broad Water and Southern Morton Bay. Here, you are likely to catch Flathead, Bream, Trevally, Mangrove Jack, Jewfish, etc. We have years of experience in making sure our customers have the best fishing experience possible. We go out farther and for longer than our competitors do and we’ll do whatever we can to make sure that you go home with a fish. We never try to rip our customers off and if we don’t feel the weather is right for fishing we will let you know and refund your money for the day rather than you wasting your time and money. On our half days, we go to the 36 fathom mark, which is 20 km offshore. Most other boats only go 4 – 5 kms offshore. On our full days, we go to the 50 fathom mark, which around 50kms offshore. The vast majority of our customers all go home with a fish. "We were joined by my brother and his wife. Loved the first day so much we went out with John a few days later. John is a wonderful host, his knowledge of fish is unsurpassed and he makes sure everyone on board is hooked up and ready to catch a big one. We didn't land the Barra, but we did catch an assortment of fish over the two days and had a thoroughly good time. We recommend John and cannot wait for our next day out on the water." 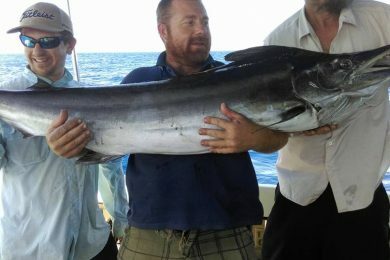 "Wanting to spend time together I researched a few fishing charter companies and settled on Gone Fishing Charters. Combined a Whale watch with a day out bottom fishing was a good choice. Knowledgable crew ensuring a fair go at a catch for all. Nothing is certain in fishing, weather or a catch but for all on this trip I'd say most had fishing satisfaction with a nice little catch by all, shared out at the end of the trip, cleaned and bagged." "After waiting many days for the weather to clear, our group of 4 novices finally got on board yesterday afternoon, along with 5 Kiwis with a lot more experience. Our lack of experience wasn't an issue at all, as Tony (owner and "deckhand") and Bob (skipper) gave us all the guidance, support and expertise we needed."